This late-Soviet-era postcard was published in 1989, which is pretty "modern" compared to most of the stuff here on Papergreat. 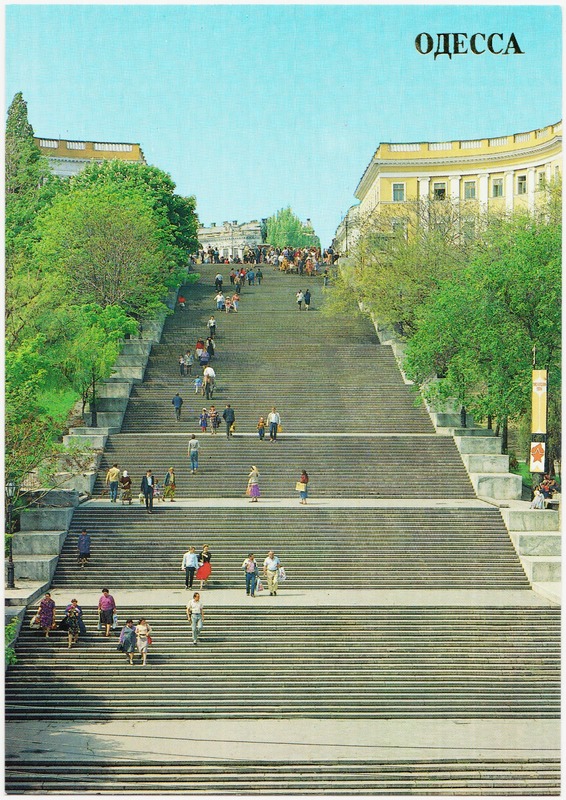 It highlights the great stairway — originally 200 steps when first constructed between 1837 and 1841 but now 192 steps — that leads from the steppe down to the Black Sea in the port city of Odessa, Ukraine. I think of them most often as the Odessa Steps, because of their place in cinema history. It is here that Sergei Eisenstein filmed the iconic "Odessa Steps" sequence of his 1925 film Battleship Potemkin. The scene, shown below, features troops from the Imperial Russian Army firing upon unarmed civilians to quell an uprising. But I'm not going to go off on a tangent about film theory. I just want to note that my introduction to movie history and the Odessa Steps sequence came as a student at Penn State, circa 1990. Some of the films we watched in William Uricchio's class, in addition to Battleship Potemkin, included Kiss Me Deadly, Gates of Heaven, Stroszek and The Great Train Robbery (that's just a small sampling, off the top of my head). 1. For more, you could start with Roger Ebert's commentary on Battleship Potemkin. Great stairway! Right to heaven! I was in Odessa 2 years ago in a journey provided by http://touristclub.kiev.ua/. Great place and i strongly recommend you to visit it. There are a lot of monuments and beautiful things.